Welcome to the College of Humanities and Fine Arts here at the University of Tennessee at Martin. See what we have to offer by clicking on the menu items to your left. 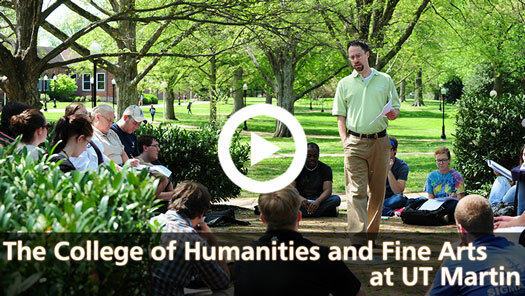 The College of Humanities and Fine Arts educates and prepares students to be responsible citizens through an academically rigorous and creative environment that provides broad and diverse humanistic experiences. We believe that by providing quality programs and degrees we offer opportunities for thought, inquiry, and expression that engage and unify the campus and the local and regional communities in a cultural life that fosters curiosity, responsible citizenship, and extended boundaries of knowledge. 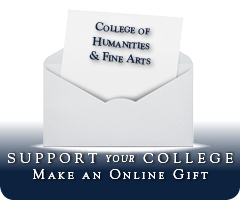 The College of Humanities and Fine Arts is composed of five departments: Communications; English and Modern Foreign Languages; History and Philosophy; Music; and Visual and Theatre Arts. The departments within the College of Humanities and Fine Arts provide majors/submajors and minors in support of the university’s Bachelor of Arts (B.A.) and Bachelor of Science (B.S.) degrees. They also offer the Bachelor of Fine Arts degree with a major in Fine and Performing Arts; the Bachelor of Music degree with a major in Music; and the Bachelor of Arts in Music. View an interactive brochure of our college.